A portable version that stores everything (activation/key-token, settings,...) within the synergy folder itself. 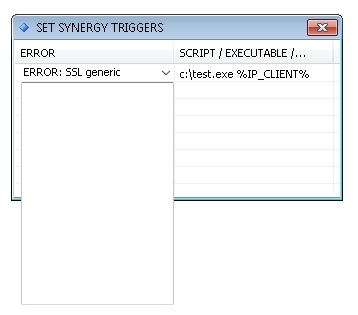 For example a small grid in which there are 2 columns, 'ERROR' and 'SCRIPT/EXE'. The first column 'ERROR' is a dropdown/combobox in which the user can select the specified ERROR and create it's own customized action (script) to it. A lot of requests might be implemented by the user / community itself making SYNERGY more extensible and taking the pressure of the requests list? I could not get the dragging of files/folders to work and I have read that this is an issue for many others. For CLIENT installs, add an right click menu option "send to server", so when the user right clicks on a file or folder and selects the option "send to server"
it is then copied to server: either to the current active windows-explorer-window OR to the desktop (if no windows-explorer-window is active).